The fifth planet was very interesting. It was the smallest of all. There was only space for a street lamp and a lamplighter. The little prince couldn’t understand the reason for a street lamp and a lamplighter. There was enough light because the planet was under many stars. And there were no other people who would need a street lamp. The little prince said to himself, “It’s possible that this man is strange, but he’s less strange than the king, the businessman or the drunk man. His work has some meaning. “The order is to turn off my street lamp. Good evening.” And he turned on his lamp again. “That’s the order,” said the lamplighter. “I don’t understand,” said the little prince. “Yes. Thirty minutes. Thirty days. Good evening.” And he turned on his lamp again. 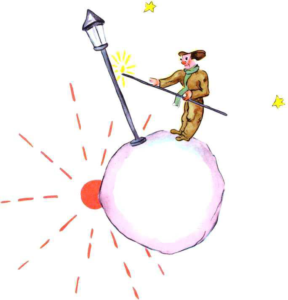 The little prince watched him and he liked more and more this lamplighter who followed the order. He wanted to help his new friend. “I always want to stop my work,” said the lamplighter. “Then you’re unlucky,” said the little prince. “I am,” said the lamplighter. “Good morning.” And he turned off his lamp. The little prince continued on his journey. He said to himself, “The others, the king, the drunk man, the businessman would laugh at this man, but he is better than the others. It’s because he cares about something else, not only himself. What the little prince didn’t want to say was that he didn’t want to leave that planet for one even more important reason. He didn’t want to leave because the planet had one thousand four hundred and forty sunsets every twenty-four hours!